Posted on Fri, Oct 28, 2011 : 5:59 a.m.
Michigan coach Brady Hoke has made it clear since arriving in January: He expects to compete for a Big Ten championship every year, including this one. Moments after concluding a memorable win last year against Illinois, Michigan football players couldn't help but exhale. They were bowl eligible for the first time in three years. "I feel like a weight has been lifted off of our shoulders," then-sophomore Craig Roh told reporters. This Michigan team earned its sixth win against Northwestern three weeks ago and qualified for its second consecutive bowl. Yet, the benchmark was greeted with little fanfare. There were no Gatorade baths. No chest-puffing in the media. "If you focus on becoming bowl-eligible, you focus on winning six games, and that's not the Michigan standard," senior defensive lineman Ryan Van Bergen said this week. "Winning six games is a failure of a season by anybody's standards that played here, went here or coached here. "We're focused on a Big Ten championship. We're focused on BCS bowl games." As the No. 17 Wolverines (6-1, 2-1) prepare to face Purdue (4-3, 2-1) at noon Saturday on ESPN2, it is difficult to avoid parallels to the collapses of the past two seasons. They were 9-0 entering matchups against Michigan State, but lost those games and finished a combined 3-13. Michigan was 6-0 this year before suffering its first loss to the Spartans. But there are several indicators that suggest the Wolverines will not flounder this year. Some are obvious, such as their improved defense. Others are more subtle, such as the changing culture of this program. The players' reaction to bowl eligibility is a good example. That's not an indictment of the goals set by former coach Rich Rodriguez. He certainly wanted what his players, fans and school wanted, which were championships. But he was slowed by a three-win debut in 2008, which snapped Michigan's NCAA-best 33-year bowl run and exasperated those in and around the program. "That kind of sent a panic wave through Michigan alums," Van Bergen said. So, when Michigan made a bowl last year after a two-year absence, players -- and coaches and administrators -- celebrated. "(Bowl eligibility) was something kind of hyped up the previous two years -- 'Are they going to make a bowl game, are they going to be bowl-eligible?' -- because we broke that streak three years ago," Van Bergen said. That falls on Brady Hoke, for whom "not good enough" is a well-worn locution. And bowl eligibly simply isn't good enough for him. Hoke has made it clear since arriving here in January: He expects to compete for a Big Ten championship every year, including this one. In that regard, the fact there wasn't a single bowl-related question or comment after his team qualified for one against Northwestern seems fitting. After all, six-win teams don't win league titles. Juxtaposed against the reaction to bowl eligibility last year, though, the silence is stark. During a season in which a few big things have made a huge difference, this small one has meant just as much. That attitude and expectation have trickled down to Hoke's players. "The leadership is different, the attitude is different," Van Bergen said about the culture change this year. "I think the main reason (a losing skid) won't happen is we won't let it happen. "There's not going to be a crash-and-burn. This one stumble isn't going to lead to this stopping. We're going to keep picking up momentum. We're not going to be stopped from our goals." Those goals start with a Big Ten championship. If they miss, at least they'll miss with more than six wins. Only one time in 45 years has Purdue beaten the Wolverines at Michigan Stadium. That game, of course, came in these teams' last matchup in the Big House. In 2009, the Boilermakers helped seal Michigan's free fall from a 4-0 start to bowl-less finish with a stunning 38-36 win. Michigan is coming off an idle week intrepidly warding off the demons of consecutive second-half collapses. It'll go back to what it was doing best: Tackling well and running free. Sat, Oct 29, 2011 : 5:05 a.m.
Fri, Oct 28, 2011 : 11:35 p.m. Experience, Talent, Support, better D, weaker BT, and if the Coaching Staff is as good as we say they are, M should not have a collapse. If 7-5 last year was unacceptable, then how in the heck will 8-4 this year be a success? That's just winning 2 out of the last 5 BT games, and yes, that will be a collapse. I like Hoke &amp; Co. and I like this team, I like the position M is in, they're capable of winning now, having a great team next year, and good teams to follow, and it didn't take years as ND to get here. In 2007, LC retired, M lost a lot to graduation and some moved on. 2008, new coach, new philosophy, new scheme, and young inexperience team without any returning starters at key positions: QBs - DCone(S), NSeridan(S), SThreet(F), JFeagin(F), RBs - Brown &amp; Minor, no stud WR and the OLine did not have any Sr's and only 3 Jr's on it. Let's be real, this team was not going to be very good and most definitely not make a bowl game even if LC returned. No one person is to blame, M was just at a crossroad in it's program. 2009, RR's freshmen class ( 5-7 ), 2010, RR's fr./sop. class ( 7-6 ). That's only 2 years to be back over .500, and 3 ( BH 1st yr ) 2011, to be competing in the BT, and 4 who knows, maybe competing for the BT championship &amp; NC. We keep looking back the last 3 years at only the negative that we don't see the good that's come out of it, but thanks to RR, BH is in good position to have a successful career at M right away without waiting 2-3 years to develop his recruits. No team is going to stay on top forever without a fall, let's be glad it did not take long to climb back up! Fri, Oct 28, 2011 : 4:46 p.m. I'm glad I'm going to this game. I expect to see a Big Blue bounceback. I just hope i'm not sliding on my tears on the way out. Fri, Oct 28, 2011 : 4:17 p.m. I looked at an email I sent to a buddy before the season started, that had my game by game predictions. I had Michigan going 7-5, small possibility of going 8-4. I think our expectations change as the team improves game by game. I believe Hoke and especially Mattison are making lemonade with what they have Denard is both a blessing and a curse 8-4 is a true success THIS YEAR, anything beyond that is a bonus This game agst Purdue is more important than people think - I think Hoke gets them refocused and we take it 34-10 GO BLUE! Fri, Oct 28, 2011 : 4:08 p.m. I'm going to have to give up making predictions. In my head I know we were not going to be undefeated, but when it comes times to make a prediction, my heart cannot pick against our team. Go Blue ! Fri, Oct 28, 2011 : 4:07 p.m.
msu actually did UM a favor two weeks ago. UM will NOT be in that postion again, the rest of the year. Blocking on offense, and shedding blocks, on defense will be vastly improved, going forward. Look for a 'statement game' saturday, as UM rolls 42-14. Um will win on the road at both Iowa and Illinois, (provided they stay relatively, injury free), thus surpizing many of the 'fair weather' fans on here. Nebraska, WILL be a tough game, after the Huskers, embarrassment of msu, saturday. The NU game will decide the Legends rep, in the Championship game, as Iowa also will beat msu. The season-ender, against osu will be another 'statement' game for Hoke, and UM wins that one handily, again, provided there are few injuries to the Wolverines. msu, on the other hand, was fortunate to win the past two weeks, and will be exposed as a fraud, by both Nebraska and Iowa. They will finish 9-3, which is still a very good season for them. They will lose their bowl as well, finsihing the season with a mark of 9-4. Sat, Oct 29, 2011 : 1:32 a.m.
Whew! Next time please tell me how you really feel. (Twilight Zone theme music plays in background). Fri, Oct 28, 2011 : 6:15 p.m.
Bob of the 'Saline Bobs'. msu IS dirty, but NOT particulary good. (that's why they must resort to cheap shots). A dozen personal fouls were required to beat UM, and UM still, had a shot at winning the game with 6 minutes to go. The ESPN film of Goulston's attempt to snap Robinson's neck, while Robinson was pinned under the pile, has become 'the face of Spartan football', and it will remain so, for YEARS to come. The so-called msu 'win' vs Wisconsin, required a helmet to helmet spear on the UW starting running back, knocking him out of the game for the balance of the first half. The refs did not have the guts call, first and goal, on the one foot line with 0 seconds left, thus forcing the OT. Both games should been losses as UM/UW could have stuck a fork in the Spartans, as they were done. msu will not not be able to escape reality in Lincoln, on saturday. Fri, Oct 28, 2011 : 4:44 p.m.
MSU was fortunate to win the last three games. And they'll be fortunate to win their remaining games. Every time anybody wins a game it's a fortunate thing. Duh. Or do you mean lucky? Luck is the residue of hard work. And talent. MSU is 16-3 over the past two years. That's pretty pretty pretty pretty good fortune. So if MSU is a fraud what does that make UM? I think if you are half as good a prognosticator as you think you are--you could become rich and famous as an ESPN analyst. Fri, Oct 28, 2011 : 4:02 p.m.
Wow! I logged in to respond to a post that is now removed. Too bad. Fri, Oct 28, 2011 : 1:04 p.m.
Fri, Oct 28, 2011 : 12:31 p.m. I see Michigan coming into this game with a whole new demeanor. They felt what it tasted like to be on top and fall too many times. I feel bad for Purdue, because Michigan is going to roll on Saturday!! I think 35 points is about right for Michigan, but Purdue scores 14 or less. Don't forget, we have the best weapon in college football and believe it or not...he can pass. This bye week will help him find routes and he is now on a 2 progression then run scheme. If two routes are covered, he will be taking off. This should have happened a long time ago!! At least Borgess finally realizes that now! GO BLUE!! Fri, Oct 28, 2011 : 12:26 p.m.
Purdue will get blown out of the stadium tomorrow. The difference between this team and the last three years is that they are more composed, better coached, and have a more favorable schedule with tough teams. Some analysis on the rest of their games. Purdue will be a blow out like I said earlier. They just dont have the fire power or D to hang and this one will be a 45-17 type of game. Playing at Iowa is always tough but I have watched the Hawks every game so far this year and their defense is nothing like what it has been in the past few seasons (my wife forces me to watch them). Their best running back was injured in spring ball so they are not that good on Offense either, even though Vandenberg and Mcnutt are good. Illinois is collapsing right now and may not win another game this season except the Minnesota game. Thats what happens when you have an unstable coach (this is what use to happen every year to MSU after Mich beat them). Nebraska will be a tough win because they are a good defensive team. It should be interesting to watch the two defenses play against basically the same offense they practice against every day. Neither QB can throw, and both are very fast. OSU is the big one and the big shocker. I think this is a statement game for Hoke. In fact, I dont think he really cared to much about the MSU game (more than any other) compared to the ohio game. Here are some teams I would NOT want to be this sat. Purdue, Kansas State, Mississippi, Ohio State, or MSU(because really who would ever want to be MSU!). All of these teams go up against other teams that are much better at all positions and highly motivated to destroy them this week! Fri, Oct 28, 2011 : 11:39 a.m.
Oh ye of little faith... ah yes, it's exciting isn't it? Everyone knew in their heart that Michigan would eventually lose a game this year. The little kid in me still wants the Wolverines to go undefeated and I believe they will usually into October, but that's only happened once in my lifetime, well undefeated and untied. Having said that, I am still excited with Michigan football. Michigan football is back. Michigan is back to when they lose, it's due a failed 4th down conversion and a pick six, not losing by being RUN over by 30+ and incapable of stopping any offense of any team. This teams coaching staff is just plain unfair. In time friends- as the years pass we will realize how truly special this coaching staff is. It's so special it's unfair. I think the reward for the Michigan seniors for enduring everything they have is this all star coaching staff. Oh ye of little faith, patience. Greater days lay ahead. You are witnessing history and the rebirth of Michigan football. Enjoy it. No matter how badly the voices inside make you nervous due to the past, relax. This is a very special time to be a Michigan Wolverine fan. We fans are truly being rewarded for staying. Go Blue! Fri, Oct 28, 2011 : 3:47 p.m.
You hit the nail right on the head, iamcris. We are fortunate to have a relatively easy schedule this year, which could help us get to 9 wins or so, but when you consider how undersized we are right now it is remarkable to even be talking about 9 wins. The coaches deserve a ton of credit. Fri, Oct 28, 2011 : 11:21 a.m. I agree heartbreak. 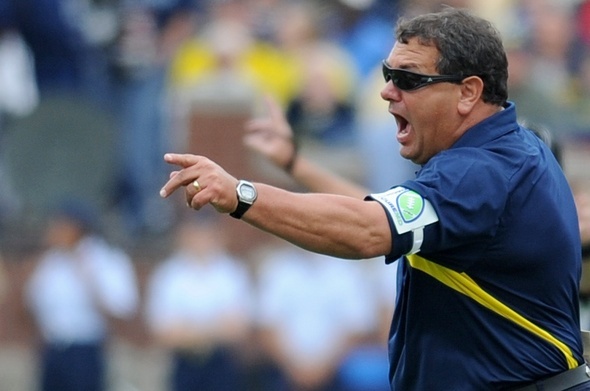 I like coach Hoke, and I think he is on the right track, but there are many reasons we will not collapse. First, we are more experienced. Hoke did not loose his seniors like RR did...that is all Hokes doing, he did a great job of selling the coaching staff to the players. RR failed miserably at this! Not only did he loose a ton of talent to graduation/NFL, but the best juniors on the team smelled something bad and bolted too. Couple that with the fact that RR had trouble keeping his own recruits, and you have the disaster that was the last three years. Second, the alumni have given Hoke the Golden ticket, he can almost do no wrong, and that's all good, but the reality is that he has a wealth of talent and experience to work with compared to his counterpart...the alumni and media aren't really acknowledging that part of it, at least not that I've noticed. All of that said I am not optimistic that we are back. I see no reason to believe we will beat OSU or Nebraska. We are at Iowa and Illinois, so those aren't gimme's either. I thought Purdue was going to be a gimme, and I still expect we will win that game, but after watching them against Ill. I'm not assuming, I'm hoping. So I see 8-4, which is respectable, but the good d's are going to show us how far we have to go. We have no running game, and Denard can't pass. The good news is that we are getting the recruits now, and in a couple years Sparty and the Bucks are going too realize that their heyday is over! Fri, Oct 28, 2011 : 10:38 a.m.
Another reason Michigan may avoid another second-half collapse: Worse competition. Illinois and Iowa are not the same standard issue that they have been, and OSU is down. The Big Ten is down as a conference, and as such, Michigan has a better shot of rising to the top. Let's not forget that very important detail. Purdue could not score more than 21 against Illinois, only scored 22 against Rice (who gave up 66 points by the end of the 3rd quarter last night against Houston), and barely moved the ball against Penn State. Why would they score 24 against Michigan? They're just not that good. And if they somehow win, that'll prove that Michigan is not that good.